Uses: Banquet Hall, Casino, Hospitality, Party Room/Amusement Facility/Attraction Colors: Blue Lengths: 7 panel 13'-1" Heights: 6'-0"
This Orange County banquet facility needed a way to obstruct the view into their commercial kitchen from guests in their banquet hall. The facility determined Screenflex portable banquet privacy screens were a functional and simple solution to their need. Here, these sound absorbing privacy walls are arranged in an L-shape to create a private area in front of the kitchen doors. This privacy allows the wait staff to exit and enter the kitchen without distracting banquet guests. Since the divider rolls on self-leveling caster wheels, each unit can be safely rolled into the position that best fits your room dividing needs. As an added feature, items may be tacked, pinned or stapled to the fabric or vinyl covered panel. 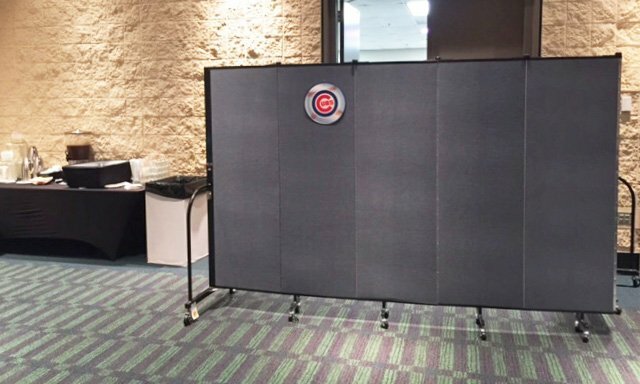 To greet their Illinois guests, the facility tacked Chicago Cub logos onto their Screenflex Room Dividers. 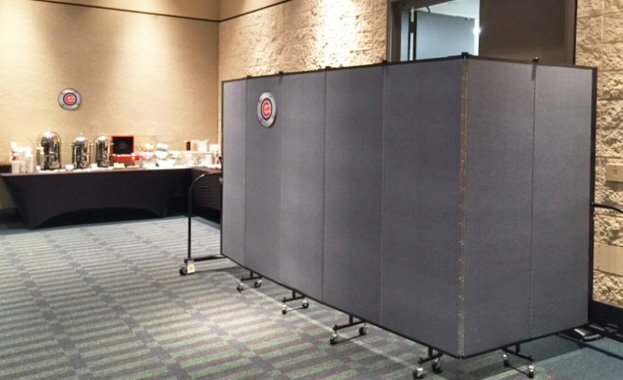 Screenflex room dividers are available in 36 sizes and 38 colors.